Home » Specialty Appliances » What is the Best Popcorn Maker for Home Use? What is the Best Popcorn Maker for Home Use? You don’t have to wait for a visit to a movie theater or fair to have delicious popcorn and you don’t have to buy the boxes of microwave popcorn filled with unhealthy flavoring agents either. If you want to save money and have a healthy snack for you and your family and friends in the comfort of your home, make popcorn fast with a small machine. The best popcorn maker for home use can be either a traditional stove top unit with a crank that you turn to keep kernels moving while they pop or an electric machine that uses either hot air or oil to pop the kernels. Whichever popcorn maker you choose to use, all you need are the natural corn kernels and if you want some buttery flavor or any other seasonings, just add that to the mix while knowing there’s nothing artificial going in. It’s a great way to enjoy popcorn in a healthy and inexpensive way. Kids will also love watching the popping action that you can’t see when you microwave a packet. If you’d like to see some more popcorn machines for home use, Amazon is a good place to look. Otherwise, we’ve shortlisted the best of the best home popcorn maker devices of every kind. 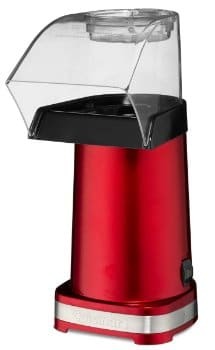 According to the best hot air popcorn popper reviews of 2015, making popcorn doesn’t get much easier when using the Presto PopLite Hot Air Popper. Just pour popcorn into the top popping chamber, cover it with the deflector, plug it in and away you go. And if you have kids, so much the better. They can easily make their own popcorn, and you won’t have to worry about hot oil, burns and a mess. It really is so simple that virtually anyone can do it, making this our pick for the best electric popcorn popper. Only using air to pop the corn makes it healthier than popping kernels in oil and it also reduces calories. Of course, if you add butter onto the little drip grill above where the corn pops, you’ll negate any advantage you have in calories and fat. And, as with all hot air poppers, salt or spices will not readily stick to the dry popcorn, so you may need to add more as you go. Because this is an air popper, some kernels of corn may fly out of the unit before they actually pop. This is a normal occurrence and a bowl beneath the corn chute will catch any errant unpopped kernels. Also, gourmet popping corn works best here and by using those you’ll eliminate a lot of unpopped corn. But for ease, simplicity, being kid friendly and a price that’s right, this is a great popcorn popping machine. You have to watch out for the clear plastic hood, though. It can start to melt and disintegrate over time if you use it to make consecutive bowls of popcorn without allowing it to cool down in between! For a unique and totally functional design in an air popper, check out Orville Redenbacher’s Fountain Hot Air Popper. This hot air popper design nearly eliminates unpopped kernels, which has always been a drawback with most hot air poppers. The center fountain column holds the popcorn, and a hinged stainless steel mesh covers the column. When the popper is plugged in, the kernels will get thrown up against the mesh, but they can’t escape. That means they will return to the bottom of the column until they actually pop. Once popped, the resulting popped corn will open the hinged mesh, and the now popped kernels will cascade into a self-contained catch bowl below. When finished popping, you can turn the unit over and the catch bowl becomes a serving bowl. This makes it incredibly user friendly, and it’s another great popper that even kids will love to use. It wipes clean with a damp cloth when finished, and since there is no oil there is never any oily mess. The unit is a bit on the expensive side for air poppers, but it is more convenient to use than most and there are very few unpopped kernels to contend with. If you love Cuisinart products, then the Cuisinart CPM-100MR Hot Air Popcorn Maker is a good choice. This may be the fastest hot air popper available, and the design comes in several different colors to match up with virtually any decor. It works much like the Presto PopLite. Fill the upper chamber with popcorn, put the deflector cover into place, and plug it in. Remember to always use gourmet popcorn to minimize unpopped kernels, and you should be good to go. This is one of the higher priced air poppers, yet it really doesn’t do a better job of popping corn. Is it good, certainly, but for the price, it should be better. Also, the deflector cover is prone to coming off when the popping is at its peak, and although it is rated to take 1/2 cup of unpopped corn into the popping chamber, it works better only using 1/3 of a cup. It is kid friendly, and it is one of the quieter units made, but the price might be a deal breaker for some, unless you love the Cuisinart name. The West Bend Stir Crazy was one of the first home designed hot oil machines that replicated movie theater style popcorn. Oil is placed onto the popping surface, popcorn is poured in and a rod rotates round and round keeping the kernels moving so that they don’t burn. When done, flip the unit over and the lid acts like a popcorn bowl. It is one of the most efficient ways to make popcorn, and if you use a gourmet style kernel, there will be very few unpopped kernels left. This is such a popular style of popper for home use, that we felt it warranted a full review with video demonstration here. For the best in do-it-yourself popcorn, the Whirley-Pop can’t be beat. This hand crank popcorn popper unit needs to be placed on your stove top to work. Pour in oil and popcorn kernels, turn the heat on and crack the handle. This is, by far, the fastest popcorn maker here, just make sure to keep cranking the handle or you’ll get burnt kernels. This very simple design is kid friendly, just make sure there is always adult supervision. But truthfully, any kid will love to use the hand crank and make popcorn. Once again, although any oil or fat can be used, a high Omega-3 oil will make this popcorn a heart healthy snack. And because there are no electronic moving parts, this is one of the least expensive units around, yet it will make popcorn with the best of them. The handle and the gearing should be oiled regularly to keep it cranking smoothly. This is particularly true where the upper gear goes through the top of the cover. A bit of cooking oil here will keep the inner stirring rods turning smoothly for nearly effortless cranking. Never use a commercial petroleum based oil for this, always use food grade cooking oil. The simple and easy to use design will let you make popcorn in record time, couple that with a low price, and as long as you have a stove top, you’ll have a winner using the Whirley-Pop. Also, this kitchen item is not a one trick pony. You can use it to roast green coffee beans if you want to and eliminate an automatic coffee roaster machine for that job.